Today we want to introduce you to Jack. Jack was an adorable little guy about 6 years old. When we say he was little, we mean it. He did not even register on the weight chart for children his age. That means that 99% of all children his age weighed more than he did. Jack did, however, love Dora more than any other child we have met! He loved Dora so much that he was willing to do anything to get more Dora, especially after his mother took Dora videos away for a lifetime an entire week while preparing for feeding therapy. Jack came to us because his mother was concerned about his height and weight. He showed signs of extreme food selectivity. He loved chocolate chip cookies, chips, and pepperoni. He was not interested in eating too much else. Jack also had food allergies. He was intolerant to gluten and dairy/casein which meant that his mother had to make special cookies for him to eat. So, thanks to Jack’s mom, we thought outside of the box to develop a model that works. Our sessions have changed a great deal since then, but the basic format remains. We started with 3 sessions each day; one session for each meal of the day. We also started using a simple shaping strategy. In behavior analysis, shaping is reinforcing successive approximations of the desired behavior. Initially, we didn’t ask Jack to eat the bite, we simply wanted him to pick it up the bite and touch it to his lips. Sweet little Jack was, quite honestly, not happy about any of it. In fact, he refused to eat pepperoni and chips (his favorites!) for Missy. But Dora, oh that little Dora talked him in to it. For just 30 seconds of Dora, Jack decided that he would try the food. You see, Jack had not seen Dora for over a week (Thank you Mom!!!). 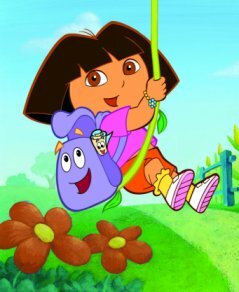 This made Dora more appealing to Jack. So it did not take long for Jack to realize that the only way he was going to get Dora was to try it our way. Soon, Jack warmed to the idea of trying new foods, not just the chips and pepperoni slices. Jack went on to make great strides. He met the criteria for graduation in 5 days. On the 5th day, he was eating foods while his mother supervised. He tried to go back to his old ways but his Mom was too smart for that. She had observed every single session. She knew he could eat the new foods so she dug her heels in. She told him that he could not have Dora until he ate his food. It is important for readers to know that ALL children, regardless of age, ability, or trait, have battles over food. When given the choice, many children would choose processed foods such as chips, crackers, and fast food, over health foods such as whole fruits, vegetables, grains, and proteins. So, even after feeding therapy is over for the picky eater or selective eater, work will still be required from time to time. Does that mean that former picky eaters should be denied access to tasty processed foods? No, not at all. The answer for follow-up to feeding therapy is moderation. Once the intensity of feeding therapy is over, the process of moderation begins. It is fine to allow your child to have chips. However, chips should be available 1-3 times per week rather than 1-3 times per day. P.S. Now that back pack song is stuck in my head!I will forever associate that song with you, Jack. Well I definitely liked studying it. This tip provided by you is very effective for correct planning.